I love cellulose insulation.1 In fact, I love all insulations. The more insulation, the better. There is no such thing as a bad insulation, only bad applications.2 But, it irritates the heck out of me when folks say stuff that is not true, particularly salesmen.3 Normally, I keep quiet and move on but sometimes the nonsense can result in real damage, particularly the stuff about “dense pack” cellulose insulation. I do not have a problem with dense packing walls. In fact, dense packing walls typically results in remarkable performance. It is the dense packing of unvented cathedral ceilings or unvented flat roofs that is the problem. First, the good stuff. One of the most effective ways of dealing with existing uninsulated frame walls is to blow cellulose into the wall cavities. It is a popular and time-proven method of retrofitting insulation and is a mainstay in low-income weatherization programs. It is popular for good reason; it works very well. Check out Photograph 1. Note the characteristic holes through which the cellulose is injected into the wall cavities from the exterior. The holes are subsequently filled and the removed siding replaced. Quality control is often done with an infrared camera to make sure that no cavities are missed. Some contractors have been doing this for more than 30 years. This is a mature, well-established method of installing insulation. Photograph 1: Retrofit Wall Insulation—Note the characteristic holes through which the cellulose is injected into the wall cavities from the exterior. The holes are subsequently filled and the removed siding replaced. Quality control is often done with an infrared camera to make sure that no cavities are missed. First, we build an “empty” wall and measure its leakage. Then, we insulate it and measure it again. This is not complicated (Photographs 2 and 3). We have done hundreds of tests, mostly because we like to annoy our graduate students. Photograph 2: Skunk Works Air Leakage Testing—They only work this hard when we have a camera and the boss is around. A test wall cavity is being insulated with “dense pack” insulation. Photograph 3: Skunk Works Air Leakage Testing—Applying air pressure and measuring flow. There’s nothing magical here. But, the results are impressive. The results are impressive. When we take the walls apart, it is impossible not to notice that the cavities get completely filled (Photograph 4). Yes, I know this is under perfect laboratory conditions, but it is also common in the field. Photograph 5 is a photo of a young engineer in Cleveland 25 years ago who didn’t believe it either, until he found the same thing in the field. Photograph 4: Skunk Works Wall—Does this wall look good or what? Yes, it is the lab, but it does look good. Photograph 5: Real World Wall—A young engineer in Cleveland 25 years ago who didn’t believe that you could retrofit blown insulation into a wall cavity and make it work. I opened up more wall cavities than I would like to admit. Two things happened. I became a believer in dense packing walls, and, wait for it, I became a fan of Cleveland. Who knew? Shame on you, LeBron. Empty walls (a wood frame wall with plywood sheathing or a wood frame wall with board sheathing, building paper and interior gypsum board) vary between 0.4 to 4 cfm/ft2 at 0.3 in. w.c. (2 to 20 L/s·m2 at 75 Pa) leakage. When we blow them with insulation (we dense pack them to around 3.5 lb/ft3 [56 kg/m3] density), the leakage drops to 0.04 to 0.2 cfm/ft2 at 0.3 in. w.c. (0.2 to 1.0 L/s·m2 at 75 P.5 This is unbelievably impressive. I think I mentioned this earlier. It gets better. This does not just happen with cellulose; it also can happen with fiberglass. Yes, you can dense pack with some blown fiberglass products, and the results are equally impressive. Wow, this is great news for the retrofit and renovation industry. There is a choice of competing products and technologies, and we have competition. Lots of good things happen because of good, clean competition. As impressive as these numbers are, an order of magnitude reduction in leakage, we need to put these numbers into perspective. Dense pack cellulose and dense pack fiberglass are not air barrier materials, and they do not result in air barrier assemblies. Although, with respect to air barrier assemblies, they sometimes come pretty close. Note that this is not the case with air barrier enclosures—entire houses. With respect to entire houses, when folks dense pack, they typically start with a very leaky old house and “weatherize” it. Big holes are covered with solid material, caulking and weatherstripping is done along with the dense packing, and at the end of the process, we get to what would be considered a pretty OK new house—but certainly not a “tight” house. Some definitions are in order. 0.004 cfm/ft2 at 0.3 in. w.c.
0.039 cfm/ft2 at 0.3 in. w.c.
0.39 cfm/ft2 at 0.3 in. w.c.
Materials and assemblies that meet these performance requirements are said to be air barrier materials and air barrier assemblies. Air barrier materials incorporated in air barrier assemblies that are, in turn, interconnected to create enclosures are called air barrier systems. 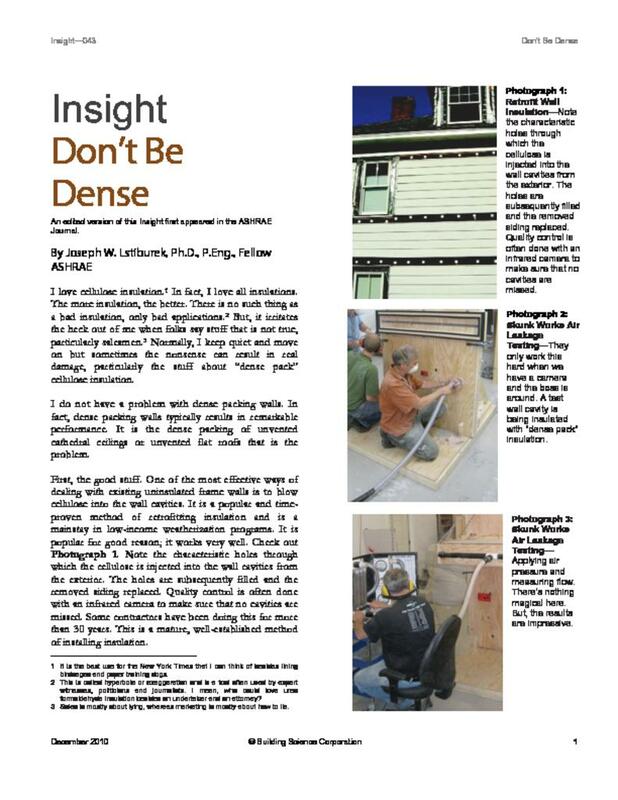 Dense packing a wall does not eliminate the need for an air barrier in new construction. But in retrofit applications we often get so close that we can typically live without one. Besides, there are no other practical alternatives short of completely reconstructing the wall assembly. So “rock on” and dense pack walls. The approach is practical and cost effective. Two caveats: First, if the wall is leaking rainwater, you have to fix the leak before you insulate. Anyone not get this? I mean, it is pretty obvious that if your basement is leaking you need to fix the basement leak before you insulate your basement? Right? And, if your roof is leaking, you need to fix the roof leak before you insulate your attic. Right? Walls are no different. Fix the leak first. Don’t be dense. Second, the energy flow across the assembly is reduced when you dense pack. We talked about this in BSI-028: Energy Flow Across Enclosures). The cladding and sheathing will stay colder and wetter longer. Paint problems are not uncommon as a result of dense packing walls in older buildings. Recall, old paint is not as vapor open and flexible as modern, newer paints. And, don’t forget about the lead. Remember to “get the lead out.” Even so, I still think dense packing of walls is a good idea, but it is not risk-free. Now, for the bad stuff. As fantastic as the dense pack approach is for walls, it is a pretty dumb approach for unvented cathedral ceilings and flat roofs. And, no matter how hard some of us work to try to stop people from going ahead and doing it, they persist on doing it. First, it is a building code violation. Second, it violates the physics. No one argues that it is a dumb idea to shove a bunch of fiberglass batts into a cathedral ceiling with no provision for ventilation air to remove moisture that leaks in from the interior. The results are often catastrophic (Photograph 6). No matter how good we are at air sealing the interior gypsum board ceiling we can’t quite get it “perfect enough” consistently to stay out of trouble. We can get lucky on one in 10, but that is not a high success rate. I mean it is possible to get a blindfolded drunk to cross Niagara Falls on a high-wire without a net, but it wouldn’t be a good idea.8 Note that not only did we insulate the roof cavity, but we also did our best at air sealing as well with caulks and foams and whatever, and it still did not work. So, what makes us think that we can dense pack a cathedral ceiling and get it to work without any attempt at air sealing? Photograph 6: Unvented Cathedral Ceiling—No one argues that it is a dumb idea to shove a bunch of fiberglass batts into a cathedral ceiling with no provision for ventilation air to remove some moisture. The results are often catastrophic. I’ve got news for you. Even with trying to get a perfect air seal, dense packing a cathedral ceiling or flat roof will not work. I am not the first to point this out to you, nor the only one.9 But, the stories of success persist, and the approach keeps getting used (Photographs 7 and 8) despite the physical evidence to the contrary (Photograph 9). Individual gamblers tell stories of winning millions in Las Vegas, but in the end, on average, the house wins. Apparently, the physics and the field evidence of failure does not deter a salesman from his mission. Photograph 7: Flat Roof—There are a gazillion of these roofs that are uninsulated and need to be addressed. Photograph 8: Flat Roof Being Dense Packed—The roof is opened up and cellulose is being blown into the roof cavity dense packing it. The guy in the middle is Jim Fitzerald, the absolute best guy in the world, and he could not make it work consistently. Does that tell you something, or what? Photograph 9: Damaged Decking—The proof of the insulating is in the opening (old insulation contractor proverb). The deck did not stand a chance. Don’t do this. So, what should we do with these flat roofs and cathedral ceilings that can’t be vented and insulated in the “typical” way? Simple, follow the building code. Add insulation on the top of the deck to elevate the roof deck temperature above the dew point of the interior air vapor mix (Figure 1) before dense packing or take the interior ceiling down and install an air impermeable insulation. Spray foam on the underside of the roof deck (Figure 2). The thermal resistance of the insulation needed to be added above the roof deck or in the form of spray foam on the underside of the roof deck is dependent on climate and the interior moisture load. Tables and a map in the International Residential Code make it easy for you.10 The building code also lets you know what a “desert” looks like and where “deserts” are located and under what conditions you don’t need to vent and can in fact dense pack. But, if you are not in a desert with no top side vapor barrier, just say no to dense packing a roof. Figure 1: Rigid Insulation Above Roof Deck—The amount of rigid insulation installed is climate depen-dent. The colder the climate, the greater the thermal resistance required. The existing roof membrane does not have to be removed. Think of this as a typical “over-roofing” approach—but with additional thermal resistance in the mix. The rigid insulation is typically mechanically attached as is the new roof membrane. The existing roof membrane becomes the “air barrier.” The roof cavity is dense packed typically from underneath, but not always. Figure 2: Spray Foam Insulation Under the Roof Deck—The amount of spray foam insulation (and its water vapor transmission) is climate dependent. The colder the climate the greater the thermal resistance of the spray foam required and, once past IRC Climate Zone 4, the spray foam should also be classed as a Class II vapor retarder at the thickness it is installed. Note that this approach requires the removal of the interior ceiling, but it does not require a new roof membrane. But, but, it is not easy to do it this way. Yes, that’s true. But, it is the easiest way that works. Don’t be dense; note the difference. Will this change? Ah, maybe. Cellulose sure can store a lot of water, safely, I might add. But we are not sure of the limits. I figure with all the failures that will occur over the next few years from folks not listening to the advice in this column we will get a pretty good idea of what those limits are. It is the best use for the New York Times that I can think of besides lining birdcages and paper training dogs. This is called hyperbole or exaggeration and is a tool often used by expert witnesses, politicians and journalists. I mean, who could love urea formaldehyde insula¬tion besides an undertaker and an attorney? Sales is mostly about lying, whereas marketing is mostly about how to lie. Did I just take another shot at modelers? I can’t help myself. Bad Joe, very bad. Don’t you just love the mixing of the units? Some metric, some imperial? Welcome to my world. All the contractors blow the stuff in pounds per cubic foot and all of us geeks measure it in liters per second per square meter at 75 Pa—our industry’s version of multiculturalism. These values come from a bunch of sources and a bunch of folks. The National Building Code of Canada buys into the material “spec” for an air barrier material as does the International Residential Code. ASHRAE/USGBC/IES Standard 189.1 goes along with all three. The material value comes from the average leakage of drywall. In 1982 I was asked by Energy, Mines and Resources Canada to come up with an air leakage value for an air barrier material. I had no clue. Whenever I had no clue, I would ask Gus Handegord of the National Research Council of Canada. He always had a clue. The first thing he always said, irrespective of the question, was that it was a pretty dumb question to begin with. That it was the wrong question to be asking. And, of course, he was always right. I would then say, “come on Gus, help me out a little here.” He would growl and scowl and say something devastatingly obvious, leading me to laugh and him to smile. For this particular dumb question of mine, Gus said, “Why not specify a number based on drywall?” He said everyone knows drywall is a good air barrier material. He said measure a bunch of samples of drywall. Then, propose the values to me, and I will recommend approval. Just don’t tell anyone we had this conversation. He just happened to be on the review committee for the project that directed me to do the work. The value ended up in the building code. When I needed a value for an “air impermeable” insulation for the International Residential Code I quoted the Canadian value. It was neat. I was basically quoting myself. Well, actually I was quoting Gus. He was Edgar Bergen, and I was Charlie McCarthy. The enclosure value comes from Andy Persily’s stuff although he does not know it. I took all of Andy’s published air leak¬age tests for commercial buildings and looked at the top 20th percentile. I figured that the top 20% of the buildings Andy tested were probably pretty good buildings and figured that they could be the basis of a recommended air leakage enclosure value. That 80:20 split was also pretty close to the Building America residential value, and I figured, why not? Oh, the Building America residential value came from me, sort of. We tested lots of production homes where we had gotten rid of the “big holes” and that got us the Building America residential value. The list of “big holes” became the EPA ENERGY STAR® Thermal Bypass Checklist. Thank you, Sam Rashkin. The assembly value comes from a painted block wall and Tamura and Shaw’s work on stairwells in the 1970s. It serendipitously fell neatly between the two values. Besides, I figured the masonry folks would buy into a painted block wall as an air barrier assembly. Et tu, Martha? Thanks for this quote go to Mac Pearce. I threatened him that I would use it. Dominique Derome did a beautiful job while at Concordia University studying the problem. Dr. Derome had great help in the field. The best cellulose installer in the world (he can be seen in one of the photos) came up to do the roofs, and the outcome still was the same. So, no whining about her not getting the cellulose installed right. Everything about this project was done right. Nice job, Dr. Derome. The paper is: Derome, D. 2005. “Moisture accumulation in cellulose insulation caused by air leakage in flat wood frame roofs.” Journal of Thermal Envelopes and Building Science 28(3). A more detailed discussion of this can be found at BSD-102: Understanding Attic Ventilation. Note that the ASHRAE Journal had it first in April 2006.